Microsoft has teamed up with EA to offer six of the game publisher’s titles to Windows Phone users with a discount of up to 43% discount. The promotion is going to be live for six days, from July 3 to July 9, and offers cool games such as Need for Speed: Hot Pursuit and The Sims 3. They are offered at 40% off ($2.99) and 43% off ($3.99), respectively. 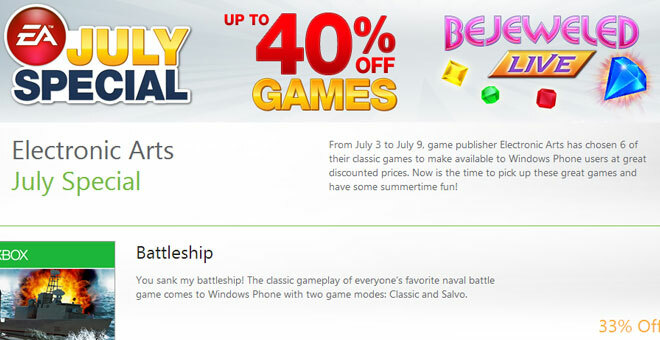 The rest of the games include Tetris, Contre Jour and Battleship, each discounted by 33% and costing $1.99 from the Windows Phone Store, while Bejeweled Live is offered at 40% off for $2.99.